Welcome to Rain or Shine Side view of the fenced in yard on a double lot. The covered porch has furniture to relax on. This couch can unfold into a sleeper if needed. The electric fireplace has a remote. Plenty of seating with 3 couches, 1 oversize chair and 1 recliner. The entertainment center has a drawer full of games. Games, cards, dice and puzzles. Through the living room is the sun room and exit to the back yard. The sunroom is a great spot to hang out regardless of the weather. Enjoy a movie from the VHS collections, also a stereo for your use Great table to do a puzzle. Through the living room is the kitchen & dining room. The table has seating for 6 with a leaf to extend it. Fully stocked kitchen with two ovens. The island has an extra sink with lots of room to prep meals. Half bath near the front door under the stairs. All bedrooms are located upstairs. King master bedroom. Flat screen has cable, BluRay and Netflix. There is also an attached bath with a step in shower. Queen bedroom, is in the middle of the King and Bunk room. The full bathroom is shared between the Queen and bunk room. The Bunk room has a TV/VCR for kids to use. This room also has a single twin to sleep 3 children. Garage has boogie boards, high chair, tennis rackets, sand toys and much more. Beach toys, clam guns, beach chairs. Bikes for renters use. Not allowed on the beach. 5 adult bikes, 3 teen bikes, and 1 toddler bike. Washer and Dryer with mud sink are located in the garage. Outdoor fire pit. The back yard is fenced and also has a bbq for guest use. Perfectly situated just steps to town and less than a five minute walk to the beach, Rain or Shine is a fully fenced lot surrounded by a nature sanctuary of mature pines, alder trees and native shrubs and plants. The large, covered country-style porch is perfect for relaxing, bird watching and listening to the ocean. A favorite for families! Bring your loved ones and dog to this gorgeous three bedroom, two and a half bath home! 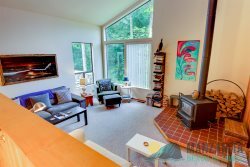 This home away from home welcomes you in with high ceilings, hardwood floors and a spacious living room. Relax by the fireplace or lounge in the reclining couch while enjoying the 58” Flat Screen TV and Blu-ray player. This home also has a great stereo system. There is a comfortable fold-out couch in the living room for extra sleeping space. Just beyond the living room is a sunroom enclosed with large windows that look out into the private yard. This room is perfect for family card games, watching movies or just enjoying a cup of coffee in the morning. Rain or Shine has an amazing kitchen with a new glass top range and oven as well as a second wall mounted oven, two kitchen sinks, cabinets galore and all the supplies you need to make wonderful meals. The large dining table currently seats six, but has a leaf which allows you to seat at least two more people. You will find a high chair available for little ones and an additional folding table and chairs in the garage. There is a half bath on the main floor close to the kitchen and living room. Up the open staircase, you will find all three spacious bedrooms. The master bedroom has a California King bed and a large en-suite bathroom with shower as well as a 40" flat screen TV, Blue-ray player and Netflix capabilities just like downstairs. The queen room is in the middle and the third bedroom has a set of twin bunk beds and a single twin bed. This room also has a small TV/VCR that kids can pull out and use for games or to watch movies. The full bath with tub and shower is shared between the queen and the bunk bed room. And there is more! In the garage you will find boogie boards, sand toys, bicycles, and tennis rackets. The fully fenced yard with brick fireplace is such a nice feature for families with small children or people with up to two dogs. Come and see why we call this home Rain or Shine. Its a great place to be - Rain or Shine! Up to two dogs welcome, must be at least two years of age, and flea treated. Five adult bikes, three teen bikes and one toddler bike. Boogie Board, Sand Toys, etc. We arrived in Manzanita early. The crew hustled and allowed us to check-in about an hour early. We wanted to extend or stay an additional night and it worked out with the schedule. I was pleased at the way the team members did all the work and just emailed me an easy link to pay through. User-friendly service. We had a wonderful time. This place is perfect for bringing a dog. Fenced in backyard and a back covered addition to the house perfect for kids and the dog to hang out. Easy peasy. I even forgot a day planner and received a call about it. The planner was mailed back to me which was above and beyond. MBG was great. Location, location,location! Everything was great. Lovely home with great amenities and central location. We hope to stay here again soon. All was wonderful with the property (well stocked, clean, comfortable beds and furniture, central location, parking, privacy, etc.) except the mildew/musty smell in the sun room which was too strong for us to be in that room, even with the windows open. We would have definitely used that room if the air quality had been acceptable. Also, was not clear in the listing that the air conditioning is only in the master bedroom. Amazing and we will be back. It was roomy, clean, and well kept. Very comfortable. Beautiful home. All good, except the confusion about the dog. It did get worked out quickly. All good. Very family friendly-bikes, games, movies, tennis rackets and much more. The location was great for our granddaughters-close to beach and close to town. We received our check in info in a timely way and each communication we had all the info we needed. I liked the follow up email after our check in, to inquire if we needed anything! The space was clean, comfortable and extremely well organized. Appreciated the cabinet with dog supplies, including towels, by the front door. The kitchen is very well stocked with a variety of cookware. We hope to return to this house for another stay! another great visit - we stayed at the same house last year for New Years, and this time for Christmas. Love the location, the house, everything was great! Very efficient and reliable team, no problems whatsoever. We had a wonderful stay, a perfect home for families. Great location and amenities. I would just recommend putting a small fan in each bedroom, we were there in the heat wave. Just to ask for a later check-out; got a quick response and everything worked out great! Knowledgeable, informative, helped us pick the best property for our family. We had a fabulous time at the Rain or Shine. The house was super comfortable, and the holiday decorations added to our great Thanksgiving experience. Just a block from a candy store, ice cream store, toy store, and Manzanita's main drag Laneda...and only a couple of blocks from the beach and playground..we didn't use our car at all after we arrived. The kitchen was nice and big...having 2 sinks was very helpful for prepping a Thanksgiving meal. Not sure that we followed the logic of where all of the items in cupboards were stored, but that is pretty minor...there is plenty of pots, pans, spices, everything...just took a bit of searching to figure out where everything was placed. The fenced yard is really nice for those with a dog...easy to let the dog out early in the morning without having to get dressed etc. The tv room is great....nice big tv with many channels.....plenty of other space in that room for doing puzzles, etc. We didn't take advantage of the sun room, or bikes, beach toys etc but nice to know that stuff is there for the warmer months. We didn't use the bbq but that is nice to have for sure. The master bedroom is huge and the master bath was nice as well. The only clarification I'd make is in regards to the # of people the house sleeps. I think I read somewhere that it sleeps 10. I'd say it's really more like 7....2 in the master bedroom, 2 in the queen bedroom, and 1 in each of the beds in the bunk room. Of course someone could sleep on a couch but I don't believe any of the couches are pull-outs unless I'm mistaken. Anyway, the house worked perfectly for us. Thanks!